In this wonderful story Mama and Papa bear start discussing needing a bigger house since the family has outgrown the small cozy tree house. When Mama and Papa Bear talk to Brother and Sister Bear they were very reluctant to move from the home they know best. Will the Bear family move or come up with a different way to expand the tree house to make more room. The Bear family finds the needs of each person in the family and then discuss how to create the room they need. Some of the needs include: Honey Bear needs her own room and Papa Bear needs a place to protect his car from the snow. God Bless Our Home evokes the true meaning of home, sweet home illustrates the importance of working together as a family. Young readers will learn that a house does not have to be big, beautiful, or expensive because every home is filled with the blessings of God. Stan and Jan Berenstain introduced the first Berenstain Bear books in 1962. 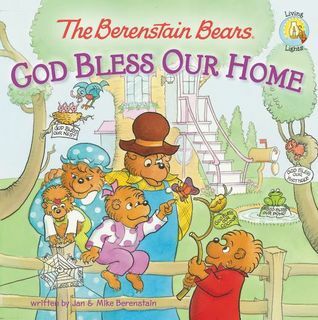 Mike Berenstain grew up watching his parents work together to write about and draw these lovable bears. Eventually he started drawing and writing about them too. Since the late 80's, he has been very much involved as a writer and illustrator with his family's creation, the Berenstain Bears. he continued to work with his mother, Jan, creating new books, writing and illustrating up until her death this year. The antics and activities of Mike's three children have provided inspiration for many Berenstain Bears Books over the years. Though Stan and Jan passed away in 2005 and 2012, respectively, Mike continues to create the delightful Bear adventures form their studio in Pennsylvania, in an area that looks much like the sunny dirt road deep in Bear Country.